I know by the calendar, it is spring, but the weather outside sure needs to get a clue! 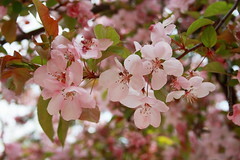 I yearn to see the trees bloom like these cherry blossoms I captured last year. I need color, green, and warmth!